Below is the third and final installment of my “Chemistry for Art Folks” series, a subsidiary of your usual Art+Science posts here at the mnartists blog. Installment #1, “Chemistry is David Bowie,” is here. #2, “Chemistry is a Rothko,” is here. Thus far in these chemistry conversations, we’ve gotten pretty Neil deGrasse Sagan about how everything that ever was and ever will be is “star stuff,” the same atoms from the Big Bang arranging and rearranging, on and on, forever and ever and ain’t it grand? But what does that actually look like? Let us leave the big picture hocus-pocus and talk about something with substance. Literally. The difference between a bunch of atoms and an actual substance is the way in which those atoms are put together. Just like the words of a story, atoms are only as good as the structure into which they are set. 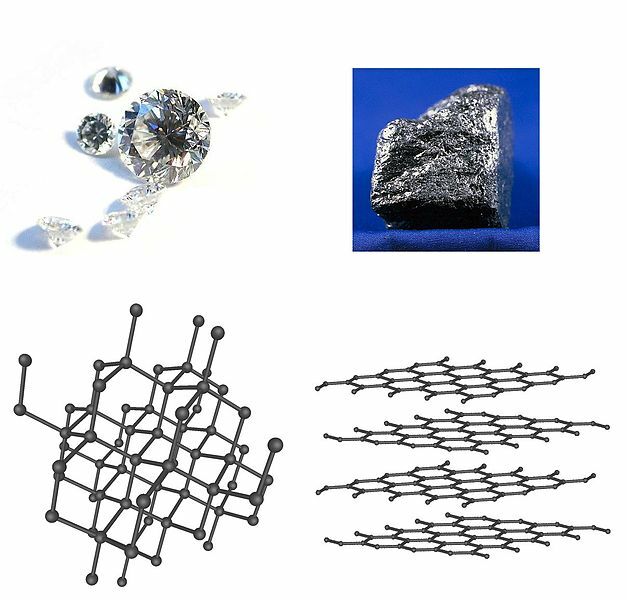 Pictured above are the molecular structures of graphite (right) and diamond. Both are made of exactly the same type of atoms — carbon. And what’s the only difference between that which universally besmirches the fingers of sketching school children and a “girl’s best friend” so structurally sound its second claim to fame is cutting other really really hard things? The only difference is arrangement. The simple rearrangement of their carbon pieces changes everything. If that seems too simple to be true, consider this: In nature, the state of a substance is determined by chemical reaction, including the vagaries of energies like heat, electricity, pressure and, maybe, the introduction of other chemicals. But as of recently, some such chemically complex changes come about through human manipulation. That is, rather than relying on a chemical reaction to rearrange the particles, we provide the mechanism for change. 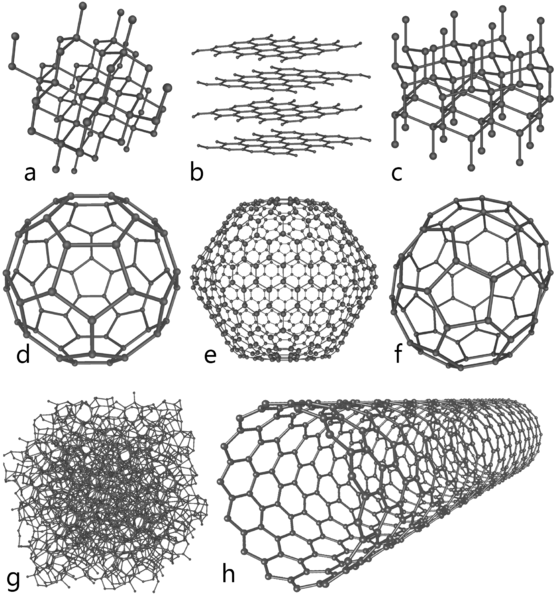 Check out that fourth one, by the way (d); that’s Buckminsterfullerene, which is sometimes found in soot and is perhaps obviously named. But that last one (h)? That’s a carbon nano tube. We humans can make those – not via some removed chemical reaction, either. 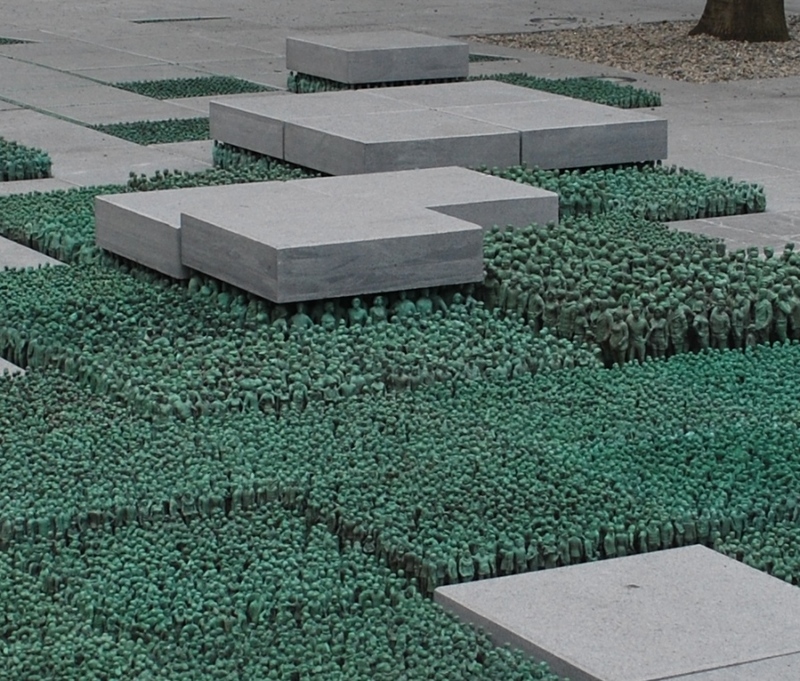 We get in there with teensy tiny nano tools and build those tubes, one atom at a time. And then we use them for stuff. We do similar work with drugs, too, building little molecular structures that will fit into our body’s receptors, just like they grab on to whatever chemicals are put in their path. So, the next time you hear your doctors talk about drugs, remember they’re talking chemistry, maybe even nanochemistry — basically man-made chemicals designed to work on that molecular (nano) level. Maybe we should call it mano-chemistry. No, yeah, you’re right – we really shouldn’t. Do you know that Flannery O’Connor story, “A Good Man is Hard to Find?” If not, please, read it, I’m begging you. I’ll wait. I mean, not to build it up too much or whatever but — okay, I’ll be quiet. You go ahead. So, imagine if O’Connor hadn’t started with that first tidbit about the grandmother’s contrarian opinion regarding Florida. Or, if she hadn’t followed that up with even more of the grandmother’s schadenfraude, then a little more, and (ohgodno, not more — oh yes) more, building grandmother upon grandmother, little by little, until (SPOILERS) the point at which she comes face to face with the ne’er-do-well, Misfit, and takes her fatal misstep, showing her true colors to be even crueler, somehow, than the cold-blooded killer who ends her life. Or, what if O’Connor had started the story with the Misfit then crammed him into a mass of grandmotherly details, upside down and backwards? Could we have found the Misfit to be as cruel as she? Would we have felt badly for her instead? It would have been a story, sure, but not an equivalent one. It is structure that distinguishes O’Connor’s glittering gem from what would otherwise be penciled-in scribblings.